It's Military Appreciation Night and our Season Opener. 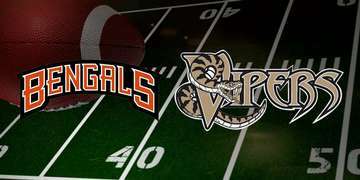 The Pierce County Bengals would like to invite you to come out and watch our match up with the Vancouver Vipers. Military personnel in uniform or with Military ID receive "FREE" Admission!!!! We also want everyone to enjoy our Circle of Vendors. Our vendors are local small business owners or crafters that come out and provide that valuable element to our fans, goods, and services. You can watch the game, eat good food and purchase a great product at our games.